Melinda is the founder of EASE. She started the charity in 2001 by establishing a sanctuary for hoofed animals in Hertfordshire from 2001 to 2003, at which point all the animals were successfully rehomed. She then set up the Pet Easement Project, fostering the pets of families in women’s refuges fleeing domestic violence. This was carried out under the auspices of the ‘Links’ group, which included the RSPCA, Dogs Trust and other national charities. In 2005 the Pet Easement Project was taken over by the Dogs Trust in London, who were able to bring to bear their considerable resources and agreed to cater for the women’s refuges in Hertfordshire on the basis of the network that EASE had established. Since then Mel has remained responsible for administration and fundraising, building up the website and producing the newsletters, and has also helped the EASE Pet Loss Support project. Mel says: “I have always wanted to work with animals, and so setting up EASE has been a marvellous experience for me. I thoroughly enjoyed running the sanctuary and learned a huge amount from it; and the Pet Easement Project has been a great way to help people and their pets. When EASE started the Pet Loss Support programme we were only one of a handful of organisations focussing on this important area, which has since then grown enormously. I am proud of the range of Pet Loss support material we are able to offer, which I know has been of great benefit to many people suffering the loss of a beloved pet. 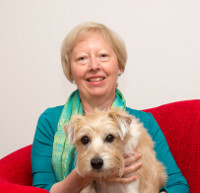 In 2001 Angela set up and developed the EASE Pet Loss Support Services, creating a broad range of audio and written support literature for this programme and for the Education Programme. In recent years Angela has worked with a national equine company on bereavement support for horse owners, which she sees as a particularly important area. “People can form an incredibly close bond with their horse, pony or donkey, and the practicalities of equine end-of-life issues can make this a particularly challenging area for owners and vet staff. So I’m delighted that this area is now receiving more recognition as an important part of Continuing Professional Development within veterinary practice; and the workshops I’ve done for horse owners and ‘Training the Trainer’ sessions for vets have been received with enthusiasm and interest.” Angela also lectured at the 2015 British Equine Veterinary Association on “Euthanasia – supporting the bereaved equine owner” reaching a large audience of veterinary professionals. 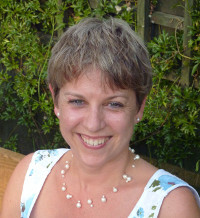 Angela was awarded a Fellowship of the Society of Bereavement Practitioners in respect of her work in pet loss support, and is a Consultant Specialist Practitioner to the Society. The Society has also conferred the SBP Trust Mark on EASE in recognition of their appreciation of the work and the quality of care provided. Angela Garner holds a Diploma in Companion Animal Bereavement Counselling, Professional Merit certificate in Basic Counselling Skills, Dip. FEA (Flower Essences Therapy for Animals), Certificate in Advanced Canine Psychology, and is a member of The Ruby Care Foundation, an international educational organisation founded by people who care deeply about all aspects of end-of-life issues.